Join artist and experienced metalsmith Helen I. Driggs in 9 watch-and-learn lessons for everything you need to know to complete your jewelry pieces with the quick use of equipment. Finish your jewelry fast . . . with helpful equipment! 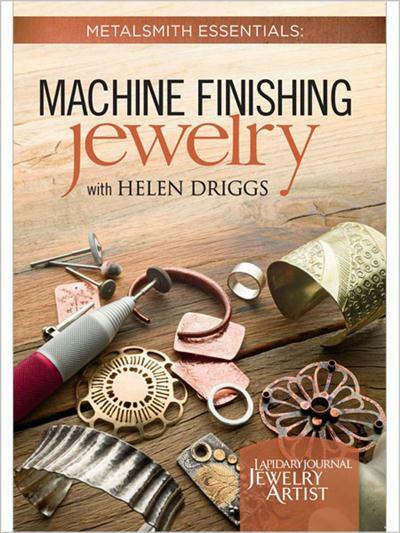 Perfect your metal jewelry with a comprehensive lesson in machine finishing. Join artist and experienced metalsmith Helen I. Driggs in 9 watch-and-learn lessons for everything you need to know to complete your jewelry pieces with the quick use of equipment. Expand your jewelry-making repertoire with how-tos for finishing metal with a tumbler, Dremel or flex-shaft, polishing arbor, and more-plus discover which technique to use for a variety of different pieces to achieve the look you desire. Get expert tips to stay safe and use the equipment properly. Uncover expert advice on what pieces should be tumbled and what should not. Incorporate a variety of finishes onto one piece for intriguing contrast. Achieve a mirror finish on big pieces with the use of the polishing arbor. Learn the variety of benefits and uses a flex-shaft has to offer. Discover the right steps to avoid cross-contamination of materials and metals.